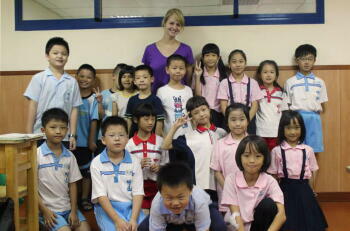 A Teacher’s Challenge Knows No Borders - Planet Aid, Inc. This blog post originally appeared as a guest article in the fall newsletter of Kids Can Make a Difference® (KIDS), an educational program for middle- and high school students that focuses on the root causes of hunger and poverty, the people most affected, solutions, and how students can help. . Learn more about the KIDS program here. My first teaching job was as an English Language Assistant at a public elementary school on the outskirts of Madrid. The educational system in Spain was dramatically different than the American one I grew up in. Lunch breaks lasted two hours, signs of affection like hugs and pecks on the cheek were distributed without fear of reprimand, and political correctness in general was simply not a high priority. And though the culture was generally laid-back, the demands on the teachers were not. Like many educators in the U.S. teachers in Spain were underpaid and forced to work within tight budgets, but they also faced challenges unique to their country. A sizeable population of Roma people, also called Gypsies, live in Spain, and while the country has made huge strides in integrating them, an estimated 80% of Gypsy students between ages 12 and 18 will drop out of school. Many of the younger Gypsy students in this elementary school seemed to be on this path, and you could sense that this extra stressor overwhelmed the teachers. Back in the United States, I’ve seen the frustration of my friends who work in our school system. They are passionate about doing what’s best for their students, but limited resources, controversial new standards, and the red tape of an increasingly bureaucratic system encumber progress in the classroom. So despite the immense cultural differences that exist from country to country, I’ve found there is one fundamental commonality among teachers in all corners of the globe: their jobs are extremely demanding. You’d be hard-pressed to find a truly outstanding teacher that isn’t underpaid and overworked. Education is often touted as the key to ending poverty, perhaps the most powerful tool we have to change the world, and yet I’d wager that most educators have at some point felt very powerless. I no longer work in a school, but I do assist with and promote educational projects in the developing world as a Communications Specialist for Planet Aid. I think about the teachers we support in the global south, and it’s hard for me to imagine how difficult their jobs must be. They face many of the hurdles typical of other educators, but they must also handle the profound challenges specific to children who grow up in poverty. Take for example the teachers in rural Mozambique: the majority of the children they teach live in austere housing without electricity or running water. Using the bathroom means using a latrine (if they are lucky), which is normally a threadbare structure made from whatever secondhand materials are available, like reeds, stakes, bags, and crates. Families often share one bedroom, and it’s not uncommon for family members to fit as many people as possible in one bed while the rest sleep on mats on the floor. Many children are food insecure, very rarely receiving the three daily nutritious meals they need to help them grow and develop properly. Staples dishes like xima, traditional maize flour porridge, are supplemented with beans, bread, cassava, rice, and vegetables, if available. As a result, an alarming 43 percent of children under age five in Mozambique are malnourished. These children are more vulnerable to developmental problems that hinder brain function necessary for learning, as well as other health issues. For many students, going to school means walking six or more miles. Once in class, they are one of at least 50 pupils assigned to a single teacher, meaning they get very little individual attention. It’s easy for children to fall behind if they miss school and difficult for them to pay attention if their bellies are empty. 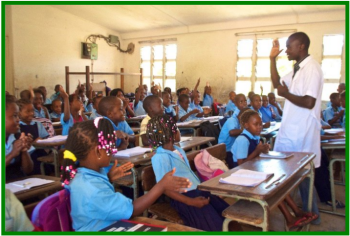 All of these problems that Mozambican children face compound into larger problems for their teachers. They must constantly catch up students that sparsely attend due to hunger, illness, or fatigue from the long journey to the classroom. They must find ways to keep students motivated and focused through personal hardship. And they must do all of this with scant resources and very little professional support. There is no simple solution to alleviate these teachers’ struggles. Changing the educational landscape means attacking the problems from all angles. One of our many initiatives at Planet Aid, the Food for Knowledge Project, aims to start chipping away at these problems that prevent children from completing their education. It first addresses one of the most primal needs of the children in Mozambique: nourishment. 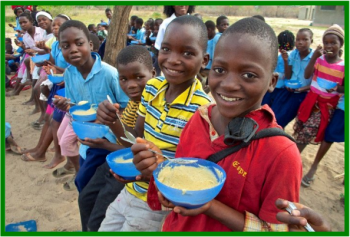 More than 55,000 students in the Maputo Province receive free school meals every day, which encourages attendance and helps kids focus during class. School gardens are being built to supplement meals and teach the children about healthy eating, and nutrition classes are being offered within the community to ensure similar knowledge is disseminated throughout the rest of the community as well. Thousands of teachers are being trained through specialized colleges that address the particular demands of working in a rural school. They are encouraged to hold after-school clubs that promote literacy and gender equality, giving extra attention to students who have fallen behind during the standard five-hour school day. The project also works toward making sure these positive changes are sustainable in the long run; community members are heavily involved with the project, school infrastructure has been built or improved to allow for the continuation of the school feeding dimension, and government officials are being given logistical training to carry on school feeding programs. On the macro level, programs like Food For Knowledge will make it easier to change the system in which teachers must operate. But the work that teachers do on the micro level is ultimately the most impressive and important. I’ve witnessed firsthand the patience, endurance, and resourcefulness that teachers all over the globe exhibit every day without fail. These individuals could utilize their talents in a field where they’d earn more money and recognition, but they choose instead to dedicate their careers to the well-being of children. Most of us are not in a position to help improve their working conditions, but we can at the very least acknowledge the work they do. We can make an effort to correct those who think teachers have a “cushy” job because they have summers off, when in reality they spend hours and hours outside of the normal work day planning and grading papers. We can eliminate the ridiculously insulting “those who can’t do, teach” phrase from our lexicon. And we can take the time to say thank you, because we all benefit from their hard work.